Students from across America arrive at the Lincoln airport the day before starting the 8-week Advanced Manufacturing Summer Institute on City Campus Monday. A group of students from Tribal College and Universities (TCU) will be on the City Campus June 18 through Aug. 10 to take part in the Advanced Manufacturing Summer Institute (AMSI). The AMSI is hosted by the University of Nebraska-Lincoln College of Engineering in partnership with the American Indian Higher Education Consortium (AIHEC) and Navajo Technical University in New Mexico. 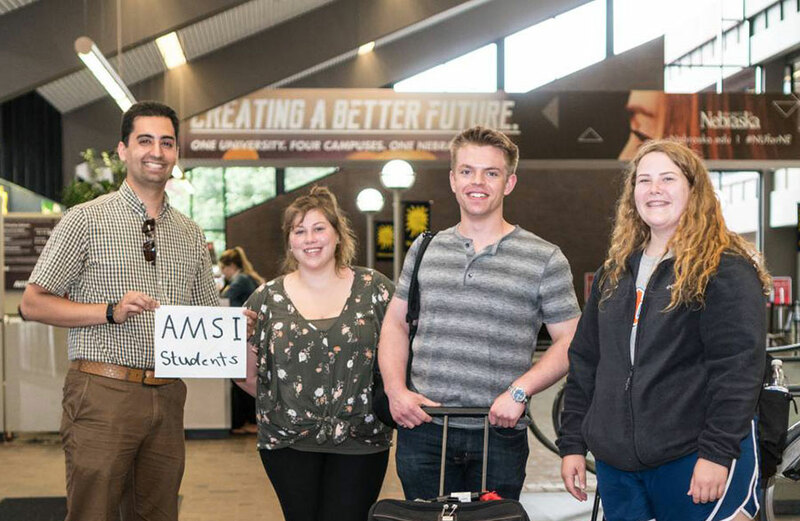 Iman Salafian, lead director of the 2018 AMSI and a R&D, mechanical and robotics engineer in the Mechanical and Materials Engineering (MME) Department, said 15 students are in Lincoln for an eight-week camp to learn engineering and advanced manufacturing skills and concepts and explore ways they can pursue careers in a wide range of STEM fields. Salafian, a laboratory manager in the Terry Research Laboratory, played a central role in designing and managing the student projects, defining the course syllabuses, managing the budget and facilitating communication with the Tribal Colleges. He believes this program provides a comprehensive and advanced academic experience as a platform for industry careers. AMSI is not only limited to the training classes and workshops but also features industry tours and company visits. Salafian is also a senior product designer and R&D engineering at Bison Inc. He said the industry tours will help students build confidence, empower theoretical knowledge and provide real life views on future workplace environments. In the 2018 AMSI, mentors are working with student teams as they design, construct and test autonomous vehicles (drones) and robots and gain an understanding of advanced manufacturing. Students will also present results to a technical audience at a research fair, using posters and oral presentations. The students will use various 3-D printers in the College of Engineering, including both metal and polymer systems. They may be able to test their designs with the new state-of-the-art metal printers in the Nebraska Engineering Additive Technology (NEAT) Labs. The institute grew out of the working relationship of Prahalada Rao, assistant professor of mechanical and materials engineering, and faculty and researchers at Navajo Technical University. Rao said AMSI is a unique opportunity for Nebraska Engineering. Among those, Rao said, are recruiting students from traditionally underrepresented group; enhancing the college and university’s broader impact on various federally funded projects; forging relationships with instructors across many TCUs and at the national laboratories, many of whom will be instructing the AMSI students; and introducing the college’s teaching skill to Tribal audiences. Primary faculty include Rao and Jeffrey Shield from the Department of Mechanical and Materials Engineering and H. Scott Halladay from Navajo Technical University. Halladay was one of the featured speakers at the recent Great Plains Additive Manufacturing Symposium, hosted by the College of Engineering. Students will also be mentored by faculty and students from various college and national laboratories, including the Laboratory for Advanced Manufacturing Processes and Sensing (LAMPS), the Applied Mechanisms and Design Lab, the Robotics Lab, the Terry Research Lab, the Center for Advanced Surgical Technologies and the Nebraska Intelligent MoBile Unmanned Systems Lab (NIMBUS).